The Color Monitor IIc was released in 1984. The Monitor IIc was a 9″ green phosphorous display, that was the first to use the Snow-White design paradigm. Renamed to Apple Color Composite Monitor IIc it was capable of supporting the maximum Apple II Double Hi-Res standard of 560 x 192. It had two modes of operation – text and color-adjusting. The c in the name of Apple IIc stood for compact. Released on April 24, 1984. Introductory price: US$1295 (with notebook-sized computer block). Picture tube: 14-inch diagonal (13-inch view). 0.52 mm slot pitch. High contrast (black matrix). Resolution: The resolution modes are 4-bit 40 x 48 and 80 x 48. User controls: Power switch, contrast, brightness, color, tint, white only button, vertical size, vertical hold, as well as horizontal hold. The Apple II monitor was released in April 24, 1984, at the Apple Forever Conference held in San Diego. The monitor featured a 9″ green Flat Panel Display and could be lugged around like a suitcase. The Apple Color Composite Monitor’s IIc picture took two stages: adjusting the text display and then adjusting the color (graphics) display. If users didn’t have a program that displayed color graphics, they adjusted only for text. To display text in 80-column form, an Apple IIc must have an 80-column card or extended 80-column card. The program displaying the text must be written to display 80 columns. The monitor alone can’t change a 40-column program into an 80-column display. If users intend to adjust the display for color, they need a program that displays a color graphic. This monitor contained internal power line fuse protection which should be replaced with the same type by a qualified service technician. Later Apple designed a successor to the compact all-in-one Macintosh, who’s case was reminiscent of Apple’s earlier Compact Macintosh series but considerably larger and bulkier. It had a larger screen, compared to the Compact’s 9- or 10-inch displays, as well as a bulging midsection to contain the larger electronics, in stark contrast to the compact Macs’ slimmer designs. The Apple IIc computer was released in April 24, 1984, at the Apple Forever Conference held in San Diego. Although somewhat overshadowed by the introductions of the Macintosh and Lisa 2 lines, the IIc held its own. The IIc came in a rare, small, portable platinum case and could be lugged around like a suitcase. The model also included an external 140k 5.25″ floppy disk drive of the same color. It ran a 65C02 processor running at 1.4 MHz. It also sported a brand-new ROM chip that allowed the user to use lower-case Applesoft BASIC commands for the first time; use a new built-in mini-assembler; and use MouseWorks, a ProDOS GUI similar to the newly released Mac OS. The IIc had 2 serial ports, one mouse port, one disk port, and 128k RAM. For portability though, it had to sacrifice the 7 expansion slots found on the earlier Apple IIe, and the motherboard prevented the IIc from getting a reliable high-speed serial connection on early models. The machine was destined for the computer illiterate, and its innovative design won it the Industrial Design Excellence Award in October 1984. It sold well until it was discontinued in September 1988 with the introduction of the IIc+, the last computer in the II series. The IIc+ included the new 800k 3.5″ floppy drive, 65C02 running at an option of 1 or 4 MHz using a built-in processor switch, memory expansion capability, and ports with mini DIN-8 connectors (same as IIGS and Mac Plus). Though much better than the IIc, it did not fare well due to compatibility problems and the rise in popularity of the Macintosh line and Apple II clones. The IIc+ was discontinued in November of 1990. The Apple IIc computer was the fourth model in the Apple II series of personal computers, as well as Apple Computer’s first endeavor to produce a portable computer. It was a 7.5 lb (3.4 kg) notebook-sized version of the Apple II that could be transported from place to place. While sporting a built-in floppy drive and new rear peripheral expansion ports integrated onto the main logic board, the computer lacks the internal expansion slots and direct motherboard access of earlier Apple IIs, making it a closed system like the Macintosh. That was the intended direction for this model – a more appliance-like machine, ready to use out of the box, requiring no technical know-how or experience to hook up and therefore attractive to first-time users. 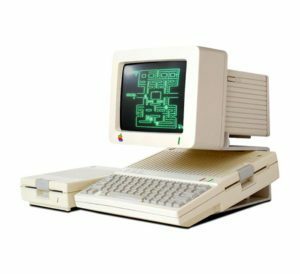 The Apple IIc line was offered not only with the choice of selecting one of two displays (9-inch monochrome and LCD), but also was available a special RGB 13-inch monitor in snow white and with a stand to make it fit the //c. These lines of computers can also be used with any composite monitor, or even with a TV set using the included RF modulator. Apple sold a variety of LCD and CRT computer displays in the past. Apple stopped producing its own standalone displays in 2016, the last one being Apple Thunderbolt display, and partnered with LG to design displays for Macs, the only displays it sells. Want to switch to a new model? Have you checked out our prices recently? Remember, the possibility to trade in your old device for top dollar cash is just a click away : Make smart decisions about your money! We at iGotOffer.com pay the best price online! Check out iGotOffer Offers page to see all current ones: Sell old Apple display online now! Free instant quote, free and fully insured shipping, fast and secure payment. We pay more that our competition.